Lock in a great price for Dar Lalamoune – rated 8.5 by recent guests! The staff were very kind and helpful. Beautiful building and great location. Traditional interior gave for a wonderful atmosphere. The staff are very friendly and helpful when asking questions about good places to eat and where to go for certain goods. The bed was super comfortable and the shower was the size of a small closet. No complaints. Cheap. Good location near the edge of the medina. Underground parking garage nearby. Good location, easy to find in Fez. That is a very good selling point. Nice stuff, very smart who showed the main sightseeings on the map. It really makes much easier for us to visit Fez. It is located inside the medina, near the major streets, with lots of restaurants nearby. The staff was awesome, always ready to help. For the price and location, the price was super friendly. This is a very pretty hotel right near all the action in Fes. We really enjoyed the tall ceilings and intricate woodwork. The staff was very helpful. The staffs are extremely helpful. I came to Fez from the desert and left one of my belongings in the car. I thought I wouldn't have it back. But then the staff, Abdullah, knows someone who works in the Nasser Palace, a hotel I had breakfast after the desert excursión and the owner gave me the number of the driver who drove me to Fes. We managed to contact the driver and he delivered my belongings to Dar Lalamoune the next day. One of our best sellers in Fez! Lalamoune is located in Fès. Free Wi-Fi access is available. Rooms here will provide you with a flat-screen TV, air conditioning and satellite channels. Featuring a shower, private bathrooms also come with a bath. At Lalamoune you will find a 24-hour front desk and a terrace. Other facilities offered include a tour desk. The guest house is 2.5 mi from Champs De Course, 1,300 feet from complexe El batha "EL Morkkab" and 2,300 feet from Medina ancient park. Saïss Airport is 8.7 mi away. The property offers parking at an extra cost. 뀐 Located in the top-rated area in Fez, this property has an excellent location score of 9.1! When would you like to stay at Dar Lalamoune? Public parking is available at a location nearby (reservation is not needed) and costs EUR 2 per day. This bed in dormitory features air conditioning, microwave and dining area. We love people for who they are and we try always to make them happy as much as we can. "i wanna have friends from... We are interested in meeting up new people, to know about their attitude, life, opinion about life matters and learn from their experience. House Rules Dar Lalamoune takes special requests – add in the next step! Please inform Dar Lalamoune of your expected arrival time in advance. You can use the Special Requests box when booking, or contact the property directly using the contact details in your confirmation. 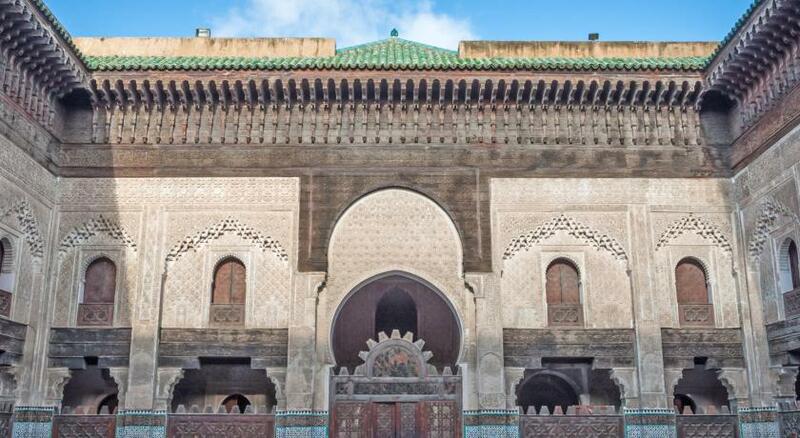 Location is excellent if you want to stroll around the Medina. Breakfast is nice and there is super hot shower! Great tips from stuff! The position was perfect, the boy who works there is very kind and always ready to help u! A bit noisy room, because of the room having a window overlooking the common patio. Thank you Abdoul for your kindness. This hostel is perfect, I recommend it. Curtain under shower doesn't seems fresh. High standard of service, helpful and friendly people, hotel looks awesome, clean room, good brakefast. No payment with credit card. There is no vieu from a rooftop, because of surrounding budings. It was one of the nisiest hoestels were I stayed during my journie. Quite high-quality (in comparison with other hostels) design. Pleasant stucco. One bathroom for a room. Hearty breakfast: juice, yogurt, butter, honey jam. A lot of different local bread or eggs. Staff is responsive and attentive. They even have air conditioning in the rooms, which is very helpful on cold winter nights. The dorm was a little crammed and the basket in the bathroom could have been emptied more frequently. But it was very cheap. It's a really beautiful place, the staff is supernice, it's cheap and very conveniently located. It's nice to have breakfast with other travelers! well located , close to the médina and soukhs. The location, the staff, very clean, good breakfast. I really recommend to the others.Very good for even a couple.